Engeyum Eppothum starts with a fairly gruesome bus crash, so it’s clear straight away that there isn’t going to be a happy ending – particularly since the rest of the film is a flashback of events leading up to the fatal accident. However the journey to get there is just as important, and on the way to the death and mayhem there are a couple of enjoyable love stories that make you wish that there was actually going to be a happy ending. 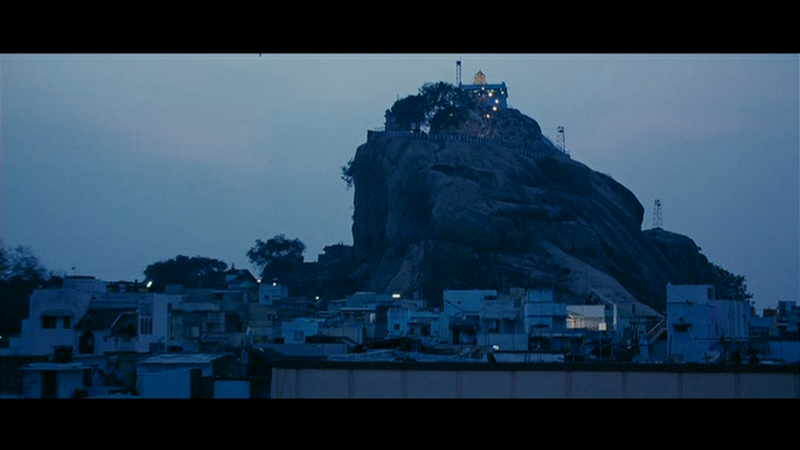 One of the stories is set in Trichy, and it always makes me happy to see the city on screen, especially when they seem to have filmed in a number of places I recognise. It’s the same with the bus station in Chennai, which also looks very familiar, and the whole film brings back memories of travelling by bus in India – although thankfully without the horror ending. One of the buses is a private bus running from Chennai to Trichy, while the other is a government bus travelling in the other direction, and the four main leads are passengers on one or other of the two. Flashbacks introduce the four and tell their story in the lead up to the accident. Amudha (Ananya) arrives in Chennai for a job interview, but is completely at a loss when her sister fails to pick her up due to a family emergency. 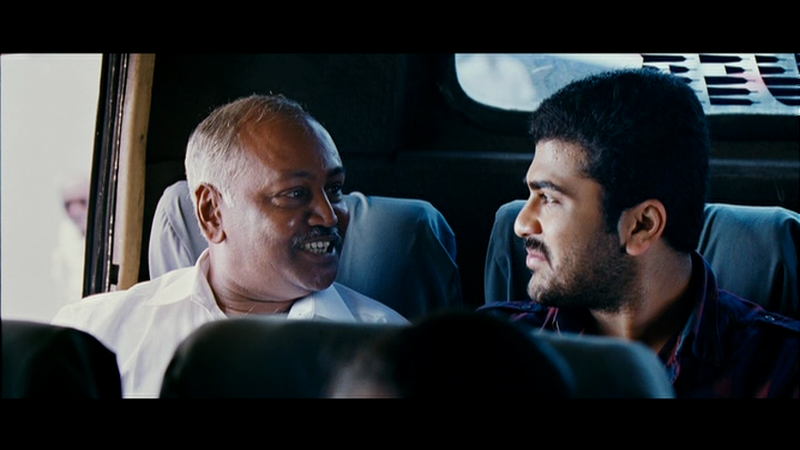 Luckily for her though, Gautham (Sharwanand) just happens to be dropping a friend at the bus station and Amudha manages to persuade him to show her to the bus stop. She’s so totally lost in the city that despite her suspicions of him, Gautham ends up spending the whole day taking her to her interview, waiting for her and then taking her to her sister’s house. Ananya plays the mistrustful girl from the country flawlessly here which is mainly why this love story feels so real. Her mannerisms, and the way she relies on her sister’s instructions rather than believe Gautham when he tells her it is time to get off the bus are perfect ‘small town girl in the big city’ behaviours which I recognise from my own move from the country. Her reaction when she sees girls in tight Western clothes is just perfect, as is the way she behaves in a restaurant when Gautham finally manages to persuade her that he is really quite harmless. Her character is very well written to show the awe and trepidation of being somewhere where everything is unfamiliar, and Ananya does a fantastic job of portraying all that angst along with the wonder and amazement. Sharwanand seems very wooden and unemotional in contrast, and while that does work to some extent for his character, there is very little emotion, and nothing to suggest that he would go to Trichy to look for Amudha later. There really needed to be more open engagement with Amudha and at least some reaction to her character which doesn’t occur until near the end of the film when it is all a bit too late. The second romance is set in Trichy where Kathiresan (Jai) watches Manimegalai (Anjali) every morning as she gets ready for work. I love that this takes place in the back streets behind the Rock Fort Temple and that they meet in Mukkambu Park (both places that I know very well), which makes their romance seem that little bit more real to me. Kathiresan has a good job, but is also from the country and is rather shy. Rather than approach Manimegalai, he is content to watch her from a distance and co-ordinate his shirt colour to whatever she happens to be wearing that day. This is a little known but obviously effective form of courtship, since Manimegalai does indeed notice his wardrobe choices. Manimegalai doesn’t have the same reticence problem at all. She is forthright and downright bossy, forcing Jai to skip work to meet her, sign up for organ donation and confront her previous suitor. Naturally she’s a nurse. Their story the best part of the film and Anjali steals the show with admirable support from Jai. He is perfect as the quiet young man, completely swept away by Manimegalai and totally out of his depth. And yet he still adores her and that comes across plainly in Jai’s body language and facial expressions. It’s a fantastic performance but he is still upstaged by Anjali. She is superb, from her initial domineering persona to the ruthlessly efficient nurse who manages to keep it all together in the aftermath of the crash. It gives her final breakdown more impact too, and suddenly Kathiresan’s devotion makes perfect sense. Throughout the romance both Jai and Anjali have good chemistry together, and as their love story develops their characters also acquire depth and back-story which also makes their relationship more convincing. Woven through the film are small vignettes about other passengers on the bus which, while emphasising the point that every stranger has a story to tell, do make the film seem more of a road safety video. Still, the developing romance between two students and the various other interactions between the passengers help round out the film and make the final scenes more engaging. The bus crash is unnecessarily graphic with severed limbs and gore in abundance, none of which really adds any more to the story. The crash alone would have been catastrophic enough and director M. Sarvanan does drive home the road safety message with a very big hammer. Thankfully, with much of the subject matter being the accident, there are no big song and dance numbers and most of C. Sathya’s music is used to move the story forward with montages of the two couples. The film title translates to Anytime, Anywhere and seems to relate to both romance and tragedy – you can meet your soul mate where and when you least expect to, and disaster can strike in exactly the same way. As such, the film plays on the very normality of every scene, any of which could happen to anyone at any moment and the characters are all very normal, everyday people. It’s a simple story and yet insightful, and one that resonates with anyone who has ever sat on public transport and wondered about the stories of their fellow passengers. 4 stars. This entry was posted in Kollywood and tagged Ananya, Anjali, C. Sathya, Engaeyum Eppothum, Engeyum Eppothum, Jai, Kollywood, M. Sarvanan, Sharwanand, Tamil. Bookmark the permalink. This is a movie that never bores me. All the lead characters were interesting; Jai and Ananya were amazing. Ironically, the director met with an accident sustaining minor injuries, while travelling from Chennai to Trichy sometime back! That’s really bizarre! Especially since the journey was between Chennai and Trichy!